Would the infamously popular Unholy Triforce that is Zelda: The Wand of Gamelon, Link: The Faces of Evil and Zelda’s Adventure sell well if Nintendo makes them available? Gamemoir’s Victor thinks they would! It’s hard to believe that there actually exist a bad Legend of Zelda game. And there isn’t one bad game in the series… there are actually three awful games set in the Legend of Zelda universe. The Zelda games on the Philips CD-i are legendarily awful. With frustratingly awkward controls, really terrible voice acting and some of the most disturbing animated cutscenes ever to grace a video game, the three blemishes on one of the greatest video game franchises have gained notoriety as the Unholy Triforce of the Zelda series. This is precisely why Nintendo needs to remaster these games as soon as possible. I’m not kidding. I really think if Nintendo got on it and released enhanced versions of these games on something like their upcoming Nintendo Switch, they would go on to be big sellers! I know what you’re thinking, “why would anyone want to play any of the CD-i Legend of Zelda games if they’re so notoriously bad?” Well, I’m not saying that they put out pixel-for-pixel ports. The keyword is “remaster.” I’m saying Nintendo should rework the Unholy Triforce and make them good! A lot of what made the CD-i Zelda games terrible, especially Zelda: The Wand of Gamelon and Link: The Faces of Evil, were the controls. From an awful button layout, mapping everything onto the second button to incredibly imprecise hit and collision detection, this just sucked out the joy of playing the games. I blame Philips for this as the “standard” controller (there were several controllers made for the CD-i) only had two buttons. At least the original NES had a Start and Select button besides the A and B buttons! Imagine then, if these games weren’t encumbered by this lack of buttons. Imagine if it was possible to open doors when you wanted to and not stab people with your sword to talk to them as the ability to interact with objects was mapped to a totally separate button. Imagine if you could open up your inventory anytime without thinking if you’d open a door or not. Imagine if there was jump button! Imagine if you could bring up the map without having to go to your inventory. Wouldn’t it be much more fun to play these games if they used modern controllers that have more buttons? The graphics for the games were actually pretty good. Zelda’s Adventure featured really good looking rendered pictures for its time. The Wand of Gamelon and The Faces of Evil also had painted backdrops that look gorgeous. Unfortunately, this actually made traversing the levels and screen harder than they should. The level designs were atrocious! In Zelda’s Adventure, it was hard to see where you could enter and exit the screen. Platform jumping in the 2D levels of the other two was made almost impossible since you couldn’t really know what was something Zelda/Link could stand on or not! These games are proof that better graphics don’t make for better games. I would believe if Nintendo got their hands on them, they would make it much more intuitive where you can go and what was something you can jump on. While the CD-i Zelda games look gorgeous for the most part, they have probably the ugliest cutscenes ever! It’s hard to believe that the people making the game that the animated cutscenes of The Wand of Gamelon and The Faces of Evil were actually pleasing to look at. They even botched the live-action Zelda’s Adventure in-game cinematics since not every scene was filmed! Some of them were just still images with some crappy fade in effects! And they don’t even show you the more important stuff! Instead, they just tell you what happened! In the opening credits, they just tell you Link’s been captured! Show us that! It would be great if Nintendo could track down the original cuts of the Zelda’s Adventure movies and release them but I don’t think they would have to go that far. It would be so much better if they just make totally new ones. They shouldn’t use real actors if they do make a remastered Zelda’s Adventure. Rather, they should use the game engine to make the cutscenes and make them transition into each other seamlessly. And for the other two games, well, anything would be better than those animated atrocities! The people and characters look like sentient blobs trying to look like humanoids and failing! The camera also zooms in and out without any rhyme or reason. Oh, and the voice acting ranges from cringeworthy to makes-you-want-to-jab-your-ears-with-a-letter-opener kind of bad. They are just so, so, so terrible… but hilarious at the same time. The biggest reason why Nintendo would remaster the Unholy Triforce is that it’s possible that there are a bunch of good games lying underneath all that crap! These games are infamous for being some of the worst games ever. It’s so easy to look at the CD-i Zelda games and make fun of them because of how crappy they look and play. That’s true but deep in your heart, you want them to be good; you know they can be good. Both Zelda: The Wand of Gamelon and Link: The Faces of Evil were made on a shoestring budget… the same shoestring budget! Both of those games were developed by the same team simultaneously, which is why they play and look so similarly. They were also made under a year; they had to make two games within that short amount of time. No wonder it played so terribly! Zelda’s Adventure fared much better but they simply overreached. The use of digitized images and pictures to make the levels eat up a lot of memory, causing horrendous load times whenever entering a new screen. But the biggest reason why these games failed so badly didn’t have anything to do with the games themselves. It was the system they were made for. While most gamers think of the Philips CD-i as a failed video game console, it actually wasn’t. The CD-i was a multimedia CD player first and a video gaming console second. It boasted some impressive specs for its time but the architecture just wasn’t built with gaming in mind, making it woefully unsuitable for action games like the Zelda franchise. Because of how infamous the Unholy Triforce is, I would honestly think there are more than just a few people who would be interested with playing them today. That in itself is a huge selling point. 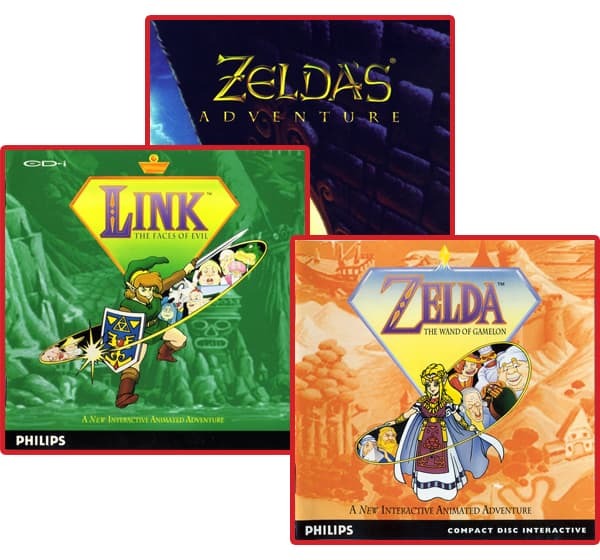 If Nintendo bundles The Wand of Gamelon, The Faces of Evil and Zelda’s Adventure in one package and makes the original version available and bundle them with remastered versions where all the issues were fixed, I’m sure there would be some takers. They’d get a laugh at how awkward the original versions control but have a blast with the remasters. So, get on it, Nintendo! I can’t wait to bomb some Dodongos on the Nintendo Switch!